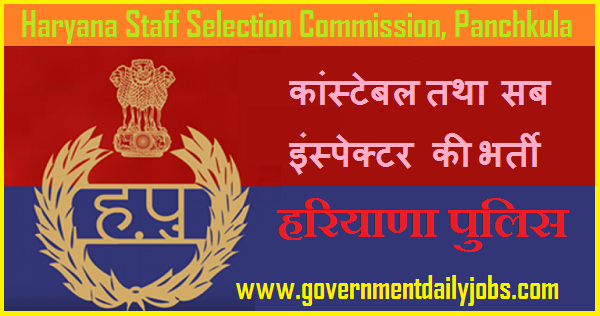 NOTIFICATION: Haryana Staff Selection Commission (HSSC), Panchkula (Haryana) inviting online applications for filling up 7110 vacant posts of Male & Female Constable and Sub-Inspector (SI) (कांस्टेबल तथा सब इंस्पेक्टर) from eligible and interested willing candidates. It is latest & good information for unemployed personnel those who are looking for these new Jobs in Government sector & other organizations. Job seekers, who wish to apply for these vacancies regarding HSSC Recruitment 2018, must have passed 10+2/ Graduation Degree in any discipline with Hindi/ Sanskrit up to Matric Standard or higher education with relevant experience. Applicant’s upper age should be as per Govt. rules and age relaxation is applicable to all reserved category candidates i.e.SC/ST /OBC /Ex Servicemen /Women candidates etc. NO OF POSTS: 7110 vacant posts of Male & Female Constable and Sub-Inspector (SI) (कांस्टेबल तथा सब इंस्पेक्टर) through Haryana Staff Selection Commission (HSSC), Panchkula. 1. Male Constable: 5000 posts - Gen=2300, SC=900, BCA=7OO, BCB=400, ESM-GEN=3SO, ESM-SC=100, ESM-BCA=100, ESM-BCB=150. 2. Female Constable: 1147 posts - Gen=528, SC=206, BCA=161, BCB=92, ESM_GEN=8o, ESM_SC=23, ESM-BCA=23, ESM-BCB=34. 3. Indian Reserve Battalion Constable (Male): 500 posts – Gen=23O,SC=90, BCA=70, BCB=40, ESM_GEN=3S, ESMSC:10, ESM.BCA=10, ESM.BCB=15. 4. Sub-Inspector (Male): 400 posts - Gen=184, SC=72, BCA=56, BCB=32, ESM_GEN=28, ESM-SC=8, ESM_BCA=8, ESM-BCB=12. 5. Sub-Inspector (Female): 63 posts - Gen=29, SC=12, BCA=9, BCB=5, ESM_GEN=4, ESM_SC=1, ESM_BCA=1, ESM-BCB=2. 1. Constable: A passed of 10+2 in any stream or its equivalent from any recognised Board and should have knowledge of Hindi/Sanskrit. 2. Sub-Inspector: A passed of Graduation Degree in any discipline or its equivalent from any recognised University and should have knowledge of Hindi/Sanskrit. 1. Constable (Male & Female): Rs. 21700-69100/-. 2. Sub-Inspector (Male & Female): Rs. 35400-1,12400/-. AGE LIMIT: Candidate’s required age should be in between of 18/21 years – 25/27 years as on 01-04-2018 for HSSC Constable & SI Recruitment 2018 Apply Online for 7110 Posts. REQUIRED APPLICATION FEE: For said vacancy a non- refundable application fee is to be paid by the candidates as per rules. Fee for Gen (Male) is Rs.100/‐, 150/- & for Gen (Female) is Rs.50/-, 75/- only and for SC/BC/EBPG candidates of Haryana State only Male Rs.25/-, 35/- only & Female Rs.13/-, 18/- only. Application Fee of is to be paid by the candidates through ONLINE MODE & E-Challan in any branch of State Bank of India & Punjab National Bank etc up to 05-07-2018. No application fee from Ex Serviceman of Haryana. कर्नाटका पुलिस ने 688 Armed Police Constable की भर्ती की अधिसूचना जारी की है इच्छुक उम्मीदवार यहाँ आवेदन कर सकते हैं। आवेदन करने से पहले पूर्ण अधिसूचना यहाँ पढ़ें 688 vacant posts of Armed Police Constable through Karnataka State Police Department (KSP), Bangalore. LAST DATE TO APPLY: 05-07-2018. 2. Physical Screening Test (PST). 3. Physical Measurement Test (PMT). Printed Copy: Printed copy of the application form with original certificates and photocopy of self- attested certificates must be brought by the candidates at the time of Interview/Verification along with Photo, Identity -proof i.e." "Identity card, Voter Card, PAN Card, Driving License, Aadhar Card or Passport". HOW TO APPLY: For said posts (Haryana Police Recruitment 2018| Latest 7110 SI & GD Constable Jobs) eligible, willing and interested candidates may apply through online mode at official website up to last date. Applicants must retain a hard copy for future reference. 2. Now check Advertisement for Constable & SI Vacancies. 3. Click to Download Official Notification and read all instructions carefully. 4. Now, Click on Online application for HSSC Recruitment 2018. 6. Then upload recent passport size scanned photograph and signature. 7. Verify your details & submit the application form. 8. Now, pay the application Fee through payment Gateway. 9. Finally take a printout of submitted online application form which can be used for future reference. 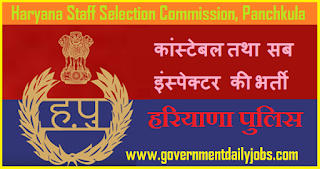 CONCLUSION: Haryana Staff Selection Commission (HSSC), Panchkula invites online application for the recruitment of 7110 vacant posts of Male & Female Constable and Sub-Inspector (SI) on regular basis from Indian residents who are eligible & interested; candidates can apply through online application. LAST DATE TO APPLY: 02-07-2018 (Date Extended) for HSSC Recruitment 2018 Haryana SI Recruitment for Constable Jobs.